Rio Rancho Art Association's guest speaker for the July program will be Ulysses Reid. He will be speaking about his process and work immediately after the business portion of the RRAA monthly membership meeting. Ulysses Reid is from the Zia Pueblo and was a hit at 2012 Indian Market. Buyers were lined up in front of his booth at 7:00 AM that first morning of market and he sold out! Ulysses is proving to be one of the best potters in New Mexico and is well respected for fine craftsmanship and also for his knowledge of Zia pottery. It takes about 30 hours to make a pot. The clay is gathered, sifted, mixed with water, coiled and and shaped by hand. Then it is painted with all natural mineral or plant pigments which have been gathered from the land. 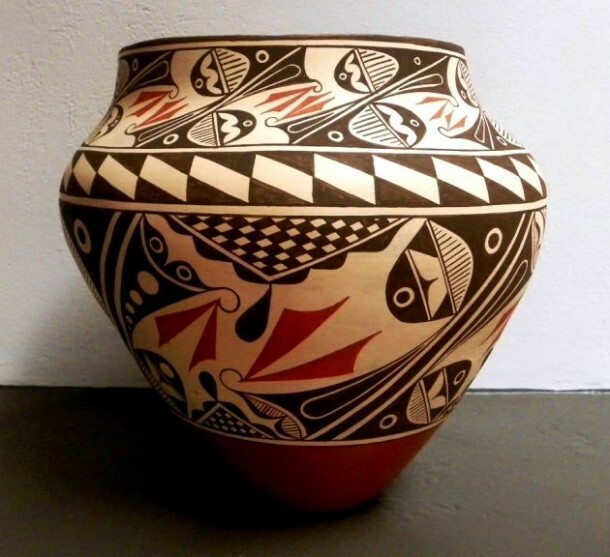 As the potter paints, he uses Zia symbols and designs dating back hundreds of years and also incorporates his own touch that makes it uniquely his. After the pot is formed and painted, Ulysses chooses to either fire the pot in a kiln or he uses an outdoor fire pit which is traditional. Ulysses Reid spent many years dedicating himself to his tribe by working for the Pueblo of Zia language and cultural preservation program. While working for the Pueblo, Ulysses coordinated several community pottery projects with expert potter Lois Medina. It was during these programs that he learned the locations of mineral paints and clays. His formal training started in 2004 when he was awarded a Folk Art Apprenticeship Grant from the New Mexico Arts to work with his mentor Rufina Panana. In a very short amount of time, Ulysses became known for his work with Zia and Mesa Verde pottery designs. Ulysses has shown at several art shows such as the Santa Fe Indian Market and Native Treasures Indian Arts Festival.